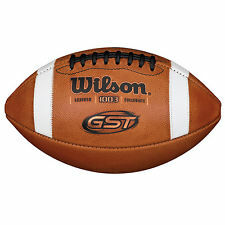 The Wilson GST football is the preferred ball of over 180 NCAA programs and 26 high school football state associations. The GST is the only football to offer patented sewn on stripes and ACL composite leather laces. Combined with exclusive Wilson GST leather, the GST offers one of a kind game saving technology. Wilson is the #1 name in football and offers the best selling game footballs in the country, the Wilson GST.